A cheery little reminder of your loved ones. Many people are so attached to their deceased loved ones that they keep the ashes. Why not go one step further and get several forward-thinking members of your family and all agree to, once you are dead, your flesh be removed and your now de-fleshed bones become part of a ornate chandelier? This could be kept in the attic, or proudly displayed in your front living room. Of course, for the more conservative, you could just keep the skull and stick a candle on it for display upon the mantlepiece. The company will collect your body, de-flesh it, and turn the bones into ornaments of your choice (like a chandelier, if you and a bunch of rellies want to). 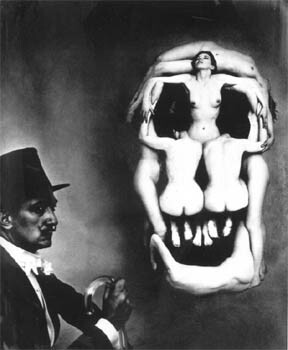 On the whole, I think I prefer the image of people drinking out of my skull. But yeah, a chandelier made of rellies, cool! Would you accept a table lamp (linky)? With a minimal business plan, you could probably buy a shell company to position yourself in the market and become an overnight millionaire before you'd need to break a single law. I think that it would be lovely to start one of these, adding more skulls every generation. Imagine what a great chandelier my great-great-grandchildren would have. By good intentions, i mean, "way to tap into someones skull without really 'tapping' into it." Turning this off would prove that the speed of light is relative, not constant. Talk about your family heirlooms. This idea fills me with trepanation. Ok, + if only to provide others with the option. I've already accounted for a full sized Tussauds-like wax replica of myself to be commissioned. Trust funds available on condition that it shall sit in a corner reading a book throughout the generations. dusted. [Ian] Nay, "Turning this off would prove that the speed of _life_ is relative, not constant." heh. heh. //This idea fills me with trepanation// Sometimes I wish I was as good with words as others here. trepanic - fear of having holes drilled in your head. I was also at Kostnice two weeks ago... Amazing place. I wanted to move in. zuzu - did you know that you can have a replica of your head modeled using bat guano - I'll do it. You only have to ask. [xz] Bat guano, eh? So, basically, I will go down through history as a sh** head? Hmmm...ok, thanks for the offer, um, I'll get with my people to discuss the option. Someone will get back with you shortly. Why not have your dead family members taxidermied. You can keep them in their old rooms and even dress them up or play house. Ever seen 'Jackass'? There's an episode where Johnny Knoxville tries to get his granny stuffed. [2 fries], that was truly awful. I giggled myself silly. [froglet] that's very, very dark. Glad I'm not related to you, don't fancy a suspicious death because your lampstand is looking a bit bare. Oh no! The dog's chewing on Grandma again! The story details her difficulty in finding someone (such as a taxidermist) who would take a human body and subject it to the usual flesh-removing beetles used in taxidermy. She finally arranged with a professor at a school of medicine to have this service performed.